Sarah Cooks: End of Exams! Let's Feast! Had my last exam today... and the first thing I did after coming home was bake some bread! Bashing that dough around was such stress-relieving fun. I didn't even use the KitchenAid to knead it - did it all with my pilates-strengthened arms. 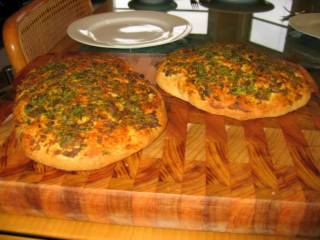 It was Nigella's Garlic and Parsley Hearthbreads. Bread is one of the things that I find very difficult to cook, so I was pleasantly surprised that it turned out very well. (Just goes to show what a good recipe it is!) Everyone on the Nigella.com forum raves about this bread. And with good reason! We had it for dinner, with some turmeric-teriyaki grilled salmon fillets, mixed lettuce, sliced tomatoes and cucumber. And a lovely glass (or two!) of crisp white wine. Perrrrrrfect! Adri: it's so professional! the colours make it look like pro! ps I've started reading Nigella's new book, Feast!! It's so ace! It's huge, thick, and full of lovely wordy paragraphs describing the food and the eating and the rituals. Mmmm... and there are lots of cool pictures too. Droolness!! I think I'll be cooking a lot in the next couple of weeks! !